The genius of Bates is founded on a deep dedication to science, supported by an enduring sense of humor. The volume is introduced by the editors' collection of "Bates's aphorisms," the wisdom of which guide much of the field today: "[T]he human capacity for language could be both innate and species-specific, and yet involve no mechanisms that evolved specifically and uniquely for language itself. Language could be viewed as a new machine constructed entirely out of old parts." (Bates & MacWhinney, 1989) The volume also contains a list of her many important publications, as well as some personal reflections of some of the contributors, noting ways in which she made a difference in their lives. 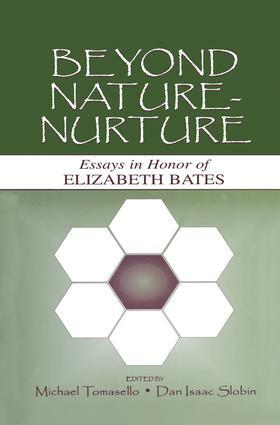 Beyond Nature-Nurture: Essays in Honor of Elizabeth Bates appeals to international scholars in the fields of developmental psycholinguistics, cognitive science, crosslinguistic research, and both child and adult language disorders. It is a state-of-the-art overview of many areas of cognitive science, and can be used in a graduate-level classroom in courses designed as seminars in any of these topics.